Previously we mentioned about SecuWipe that can securely wipe off all the personal and sensitive data for Windows Mobile devices, now if you are looking for a similar one for your Windows based PC, the freeware released by CEZEO Software will be able to help you. Named as Disk Redactor, it will ensure all the deleted files being permanently wiped off from your hard disk space, preventing them from being recovered by any third party software. The software utility is very simple to operate without the need to refer to any reference manual. Once download and install the program, just launch and it will bring you to the simple GUI. Click on ‘Wipe Disk’, select the respective folders and answer yes then it will wipe off all the unwanted data stored in it. Typically, you can select the whole local drive to be deleted before handling the machine to third party. Consumed less than 400kB, this tiny utility is good to have especially when you decide to sell off your PC without the intention to re-format or swap the whole hard disk. 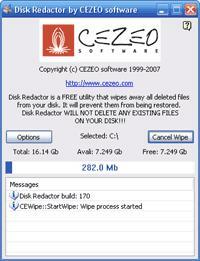 If you think it meets your need, just get a download today at CEZEO Software at no cost.